I’ve added another item to my life list. #44. Do kind things for others. In addition to self-improvement during my “year of 40” I want to find ways, both small and large, to give back in meaningful ways. 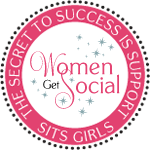 When I heard about this initiative through Clever Girls Collective – I just had to get involved. I think you will, too. The devastating earthquake of January 2010 made it virtually impossible for Haitians to make a living. Raw materials were wiped out and there’s a lack of secure and sanitary conditions and little funding to support economic relief. Through Heart of Haiti and in partnership with Fairwinds Trading and BrandAid Haiti, you can purchase handcrafted masterpieces by Haitian artisans at Macy’s. Purchasing one of these items directly benefits the artisans by allowing them to support their families with dignity and purpose. Artisans receive 22 percent of the retail price for each item in the collection. This initiative offers the first sustainable income since the earthquake, enabling artisans to repair homes, pay school fees and feed and clothe their families. With steady income comes better nutrition, improved education and access to healthcare. This initiative empowers people to use their God-given talents to support themselves and grow as a community. How incredibly powerful is that?! 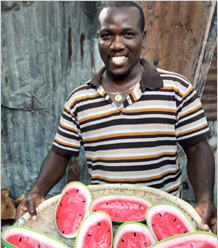 That’s why I’m purchasing one of these watermelon bowls made by 29-year-old Haitian artist Blase Emilien. Many other artists have created beautiful pieces, from recycled oil drums to wrought iron and stone – there’s something for everyone. Make shopping meaningful and go to http://bit.ly/HeartofHaiti-ShopforABetterWorld to see what’s available.